Surface shaped like a saddle that allows to place a monkey's legs but also its tail (the monkey is not the mount, but the rider!). By the point O (which is a planar point of the surface) there pass 3 real lines of the surface, forming between one another angles of 120° (in red above): the point O is an Eckardt point of the surface; by the point at infinity of Oz, which is a singular point of the surface, there pass the 3 other lines of the surface, that are also real, but at infinity. O is also an umbilic. 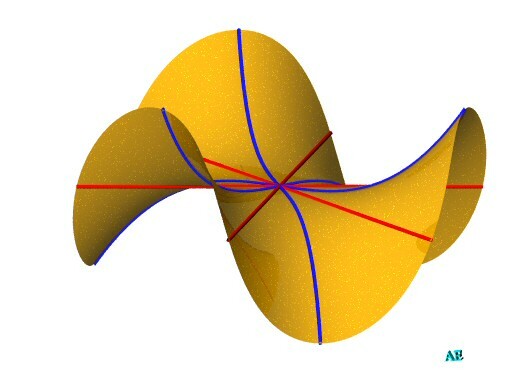 Generalization: surface with a saddle where end n valleys and n mountains: (hence a surface with rotational symmetry). 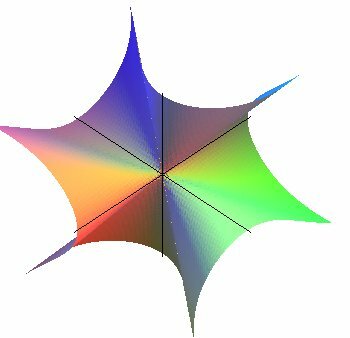 The case n = 2 gives the horse saddle or hyperbolic paraboloid and the case n = 3 the monkey saddle. 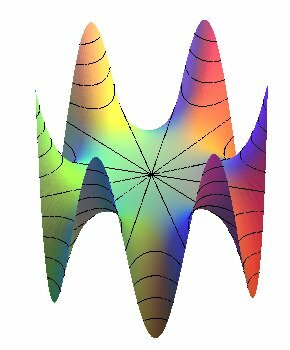 Other surface with 3 valleys, 3 mountains: ; but the saddle is not comfortable, there is no tangent plane at O (it is a cone , cf. Cartan's umbrella). Compare to the Enneper surface.